Brendan Foley peels his wetsuit to the waist and perches on the side of an inflatable boat as it skims across the sea just north of the island of Crete. Foley, a marine archaeologist at the Woods Hole Oceanographic Institution in Massachusetts, and his colleagues at Greece's Ephorate of Underwater Antiquities in Athens have spent the day diving near the cliffs of the tiny island of Dia in the eastern Mediterranean. They have identified two clusters of pottery dating from the first century BC and fifth century AD. Together with other remains that the team has discovered on the island's submerged slopes, the pots reveal that for centuries Greek, Roman and Byzantine traders used Dia as a refuge during storms, when they couldn't safely reach Crete. Archaeologists have precious little information about the seagoing habits of the Minoan civilization, which erected the palace of Knossos on Crete — linked to the Greek myth of the Minotaur. Minoans far exceeded their neighbours in weaponry, literacy and art, and formed “part of the roots of what went on to become European civilization”, says Don Evely, an archaeologist at the British School at Athens, and curator of Knossos. 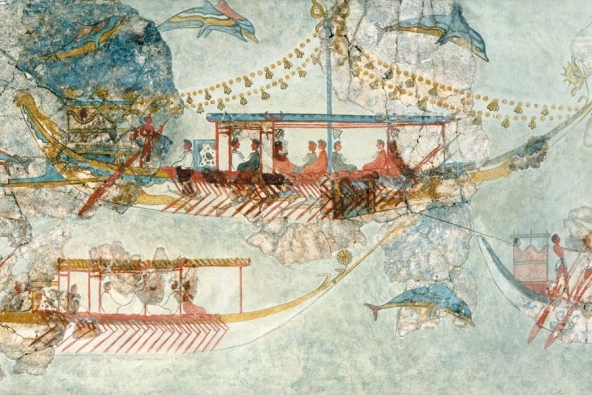 Archaeologists are keen to understand what made the Minoans so successful and how they interacted with nearby cultures such as the Egyptians.